Hmm, but why limit it to the City? Can anyone create/teach me how to maintain a spreadsheet or documentation process that is publicly accessible online? other people probably know how to do this better than I do, but if you put them on a map they can be annotated and exported… like the crash map or ToR map. Swalfoort wrote:Can anyone create/teach me how to maintain a spreadsheet or documentation process that is publicly accessible online? Look into GD FusionTables, or similar, and see if you can feed one from a form. Fusion Tables is googledocs’ term for a spreadsheet, specific columns of which are specifically marked as a certain kind of data to be made into a visualization—in this case, geographic data which can be automatically plotted on a map. If you can combine that with a gd form (which automatically feeds into a spreadsheet), you can get a form > ss > map workflow that lets you (or “anyone”) fill out a form and plot these suckers on a map. you could probably also either export the map or the s/s with geocoded locationdata, too. Martin Willett, ?the chief deputy county administrator, was seriously injured in June when the front wheel of his bike got stuck in a “drainage gap” on the Dodge Boulevard Bridge. Yale Cohen dug up some relevant info on this topic worth sharing here. 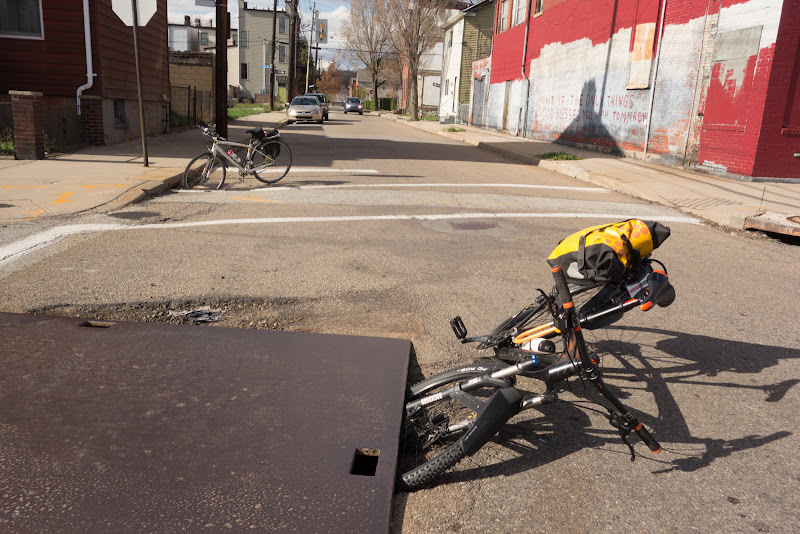 The city published a document in 2005, “Bicycle Facilities Guidelines and Policies”, containing recommendations for storm grates, apparently from PennDOT. See Figure 9. 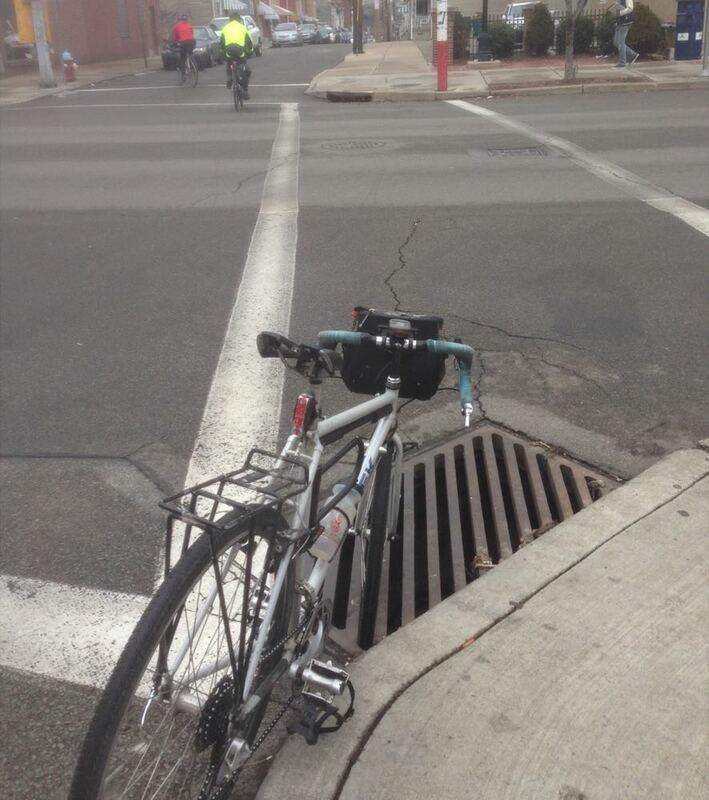 Drainage inlet grates should be replaced with bicycle-friendly types. Grates that have bars that are parallel to the direction of travel can trap the wheel of a bicycle. Even grates with diagonal bars can be hazardous to bicyclists. 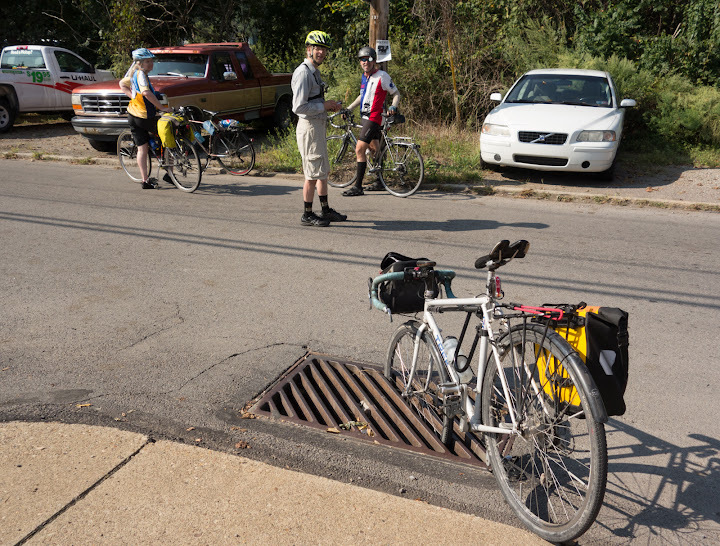 These types of grates can trap a bicycle wheel if, when located on the corner of an intersection, the bars are oriented so that the slots are parallel to the wheel of a turning bicycle. 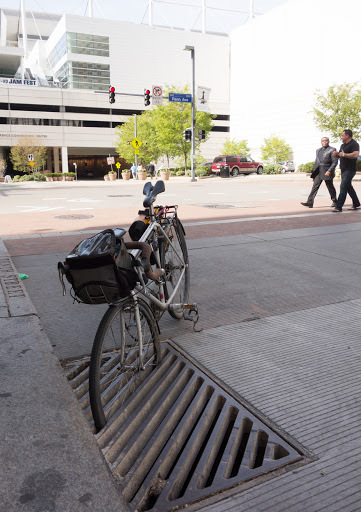 If bicycle-friendly grates cannot be installed in a timely fashion, then steel straps should be welded to the existing drainage inlet grates at 4-inch intervals, center-to-center, perpendicular to the parallel bars. 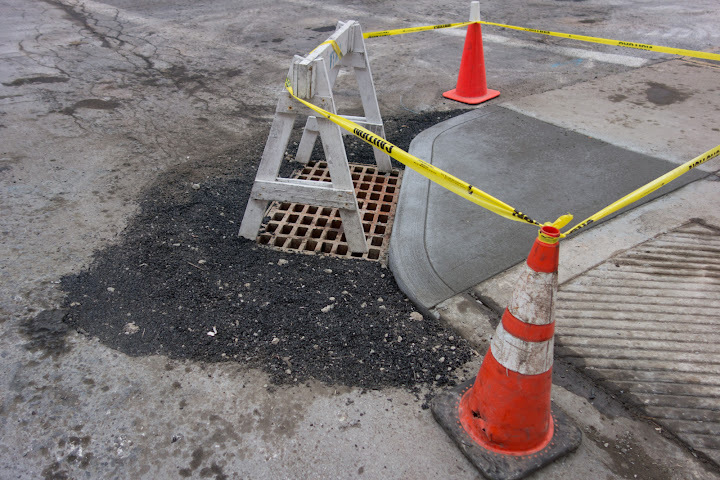 Drainage inlets should also be flush with the pavement surface. So it would appear this document has been gathering dust on a shelf for nine years. Both the city and PennDOT had the right idea that long ago. It doesn’t take an engineering degree to figure out that the county would similarly be on board. This message board thread is over five years old, with some of these grates untouched. I continue to be amazed these don’t garner more headlines. What is it really going to take to get the right departments to actually get out there and change these? Do we need a formal inventory? I would sooner spend any taxpayer money to switch out the ones we already know about instead of a formal inventory, and I don’t want to just do the city, just do one of 130+ municipalities at a time. A real story, with photos. Article NSFW btw. OUCH! I’ve had a couple grate crashes, but that takes the cake. I don’t know if you can see the photo at the link above, but it is a longitudinal grate in a sharrowed bike lane in Boston, MA. Here is a StreetView of it. It’s about two feet beyond the sharrow at mid-screen. Come to think of it, I probably have one or two on my phone that I never uploaded. Someone mentioned a map of these at one point. @swalfoort, was that you? (I see the reference at the top of this page. Possibly there was another a few pages back on this thread, but I’m too lazy to look.) Probably we need to get @erok to add a link to it to the top post on the thread, and/or a spreadsheet, a la Tag-o-Rama. 311 that puppy, if you haven’t already. I like to pose a bike in the picture and tweet it in, via @pgh311, showing proximity to the path of travel. I still keep finding new ones. There’s a nasty one up in Fineview — I wish I could remember the street corner, but I was on motorcycle, running late for an appointment. It was on the inside of a turn, with diagonal slots lined up with the direction of the turn. Someplace else I was in the past week, whoever I was with took a photo of his bike with the front wheels buried up to the hubs. Maybe in Presston on Labor Day? Again, I think there are too many to count, in certain parts of town, in otherwise very chill, bikeable neighborhoods. Wind Gap Bridge, inbound to chartiers neighborhood. Anyone know if this is city of Pittsburgh, county, or penndot? Weird thing is that it’s only this one grate. All the others are diagonal. Looks like Windgap Bridge, though not either of the connecting roads, is owned by the County, based on this 2008 document (PDF) suggesting it as one of a number of roads and bridges that should be transferred to the state. Thanks, Sent an email to allegheny county dpw with google map link and image. I thought that grate sounded familiar. I posted a photo on this thread on April 27, 2011, and a text post on Feb 11, 2011. Why is it taking years to fix these? 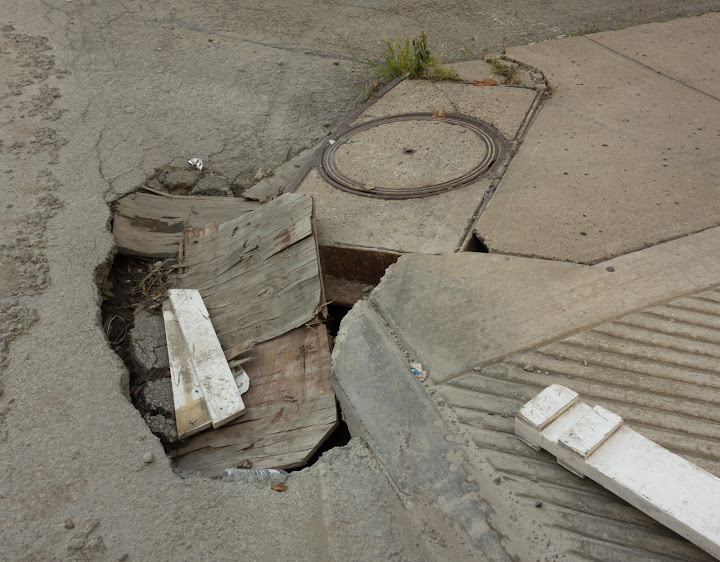 Big improvement at McKean St & S 2nd St since July: the broken sawhorse has been replaced. The storm drain sinkhole is unchanged, however. and found a couple of dangerous grates inside Calvary Cemetery. The slots looked big enough to swallow a 700×28. I’m not sure if contacting the cemetery management will go anywhere, but I’ll give it a shot. Liberty, in front of August Wilson Ctr, between Smithfield & Wm Penn. both of which exist, unchanged. My greater annoyance is that some of these have been posted for seven years, and still haven’t gotten on anyone’s radar. S 2nd St & McKean St – where old sawhorses go to die. This one could swallow not just a wayward bike tire, but a small child. Logan St just below Shoup St, Millvale. That’s a Dirty Dozen hill. 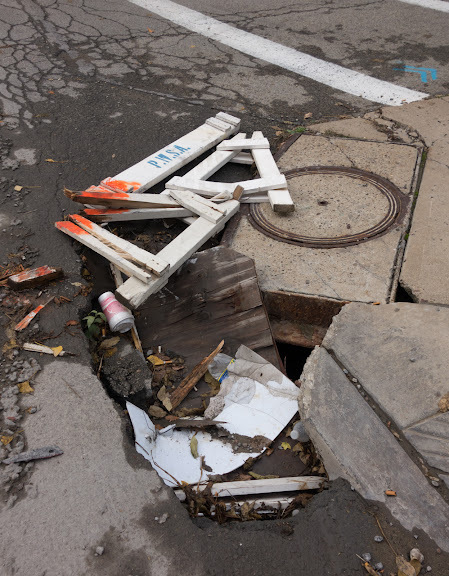 Went by S 2nd St and McKean yesterday and saw that a new, proper drain grate had been put in where that corner sinkhole is (was?). They still have a sawhorse there, but still, they finally fixed it! 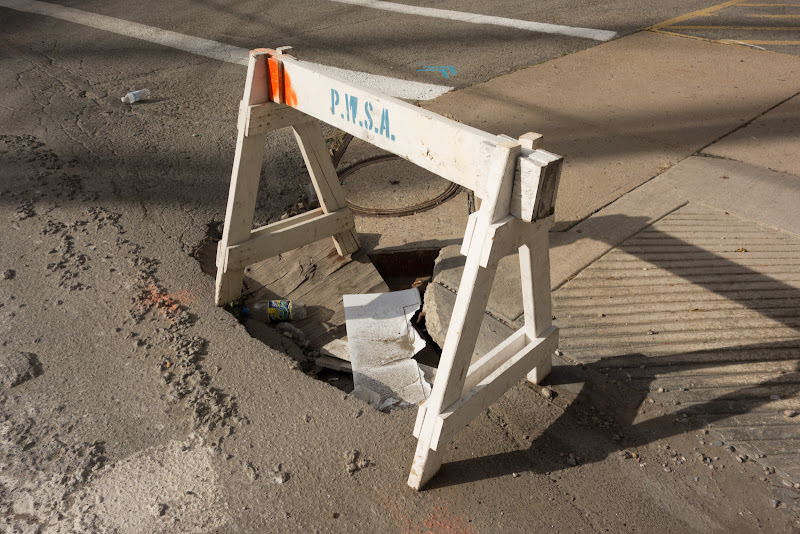 Pittsburgh Water & Sewer wants your input. 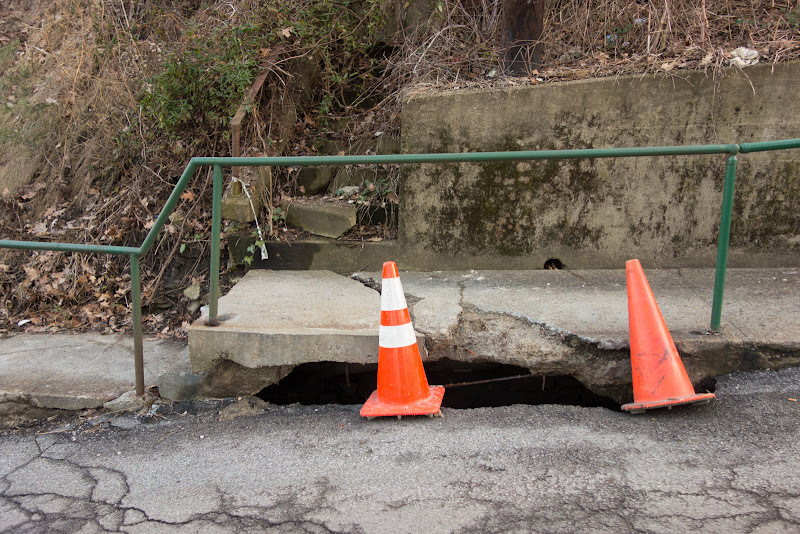 WPXI had a story of a woman’s leg getting trapped in a broken longitudinal grate in Hazelwood today, but I can’t find the story on their site. They had to use the jaws-of-life to get the woman’s leg free. 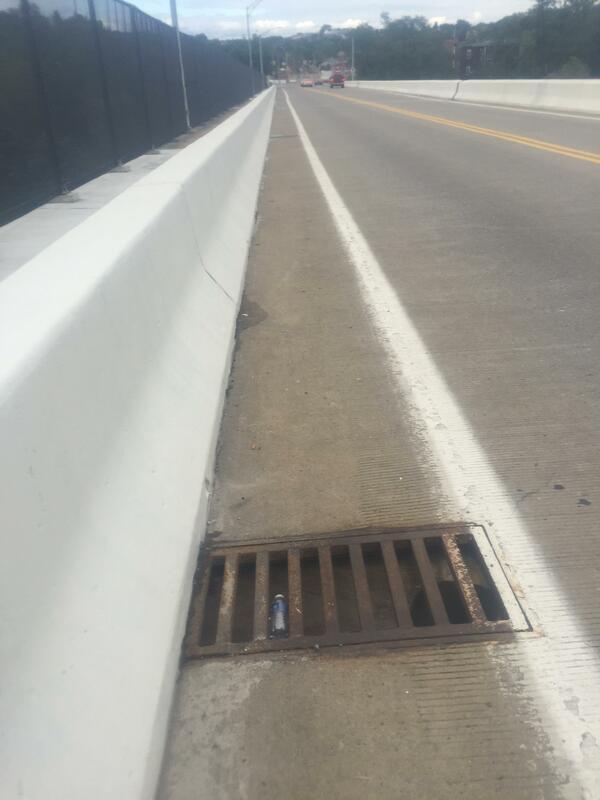 The grate had been reported to 311 at least three times in the past but Alcosan says they have no record of it being reported; the woman was looking at her phone and didn’t notice the grate was broken when she stepped onto it. They also showed another broken grate just up the street from this one. Beat me to it Marko! Wow. That was at 2nd Ave & Glenwood Ave, actually (not Hazelwood Ave). 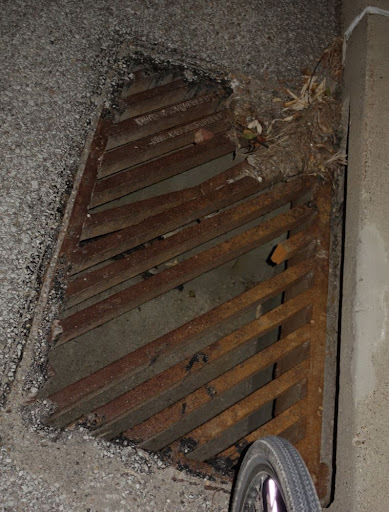 The video also shows a second broken drain grate at Glenwood Ave & Gate Lodge Way. This incident gives our efforts new importance! I just tweeted to the PWSA to ask them to please read this thread. The nice folks at PWSA already got back to me and said they will review the thread. They also asked that anyone noticing a bad grate to please use the 311 form to report it. Select Utility, then Catch Basins, then be very specific about the location. Welcome to the Convention Center! Do you want me to call an ambulance? 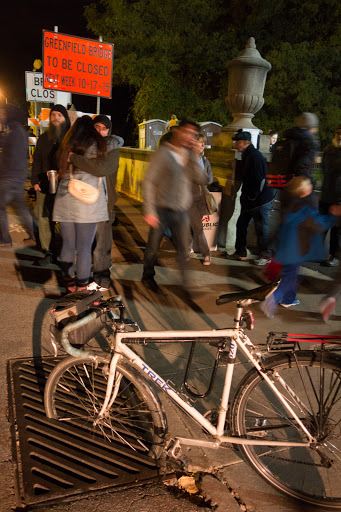 3) Grates … which, by their positioning, are not an immediate danger to travel. There are thousands of that diagonal type, and while they can clearly eat a wheel, that concern is mitigated somewhat by the tall curb. I want to get those changed out, too, but I don’t see them as important as the first couple of categories.